DELRAY BEACH, FL- Apricot Lane Boutique owner, Barry Shapiro runs his South Florida locations along with his son Matt Shapiro, going to work together and creating a truly a modern day family business. Sharing his expertise in the retail world with him in hopes he can take over the successful businesses they have created one day- perhaps a Father’s Dream. As impressed as Shapiro is with his son’s dedication and determination to the business it was in fact a circumstance outside the boutique that created the most sense of pride. 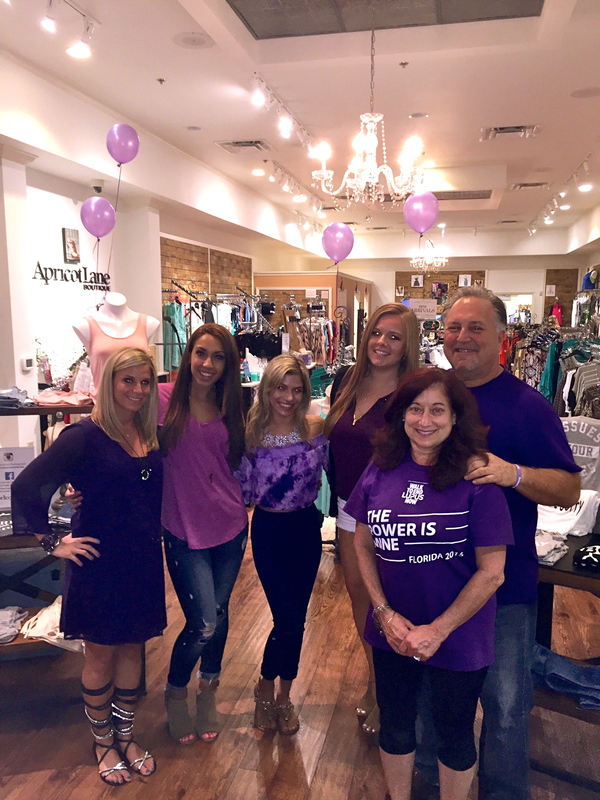 As many customers of Shapiro’s South Florida stores may know, May is the most important month for this family, Lupus Awareness is the families greatest charitable mission. Developing in store events such as the Girls Night Out Parties where ALL proceeds from the evening were matched by Shapiro and 100% donated to the Lupus Foundation of America South Florida Chapter. The store also is giving a free summer tote bag to anyone making a $10 donation in store. Straight donations can be made to his personal page at this link as well. Personally touched by this disease after Shapiro’s youngest son Jeff was diagnosed with Lupus, it was in fact in 2014 when he needed a kidney transplant as a complication of this disease. Shapiro’s oldest son and work companion, Matt Shapiro donated that kidney to his brother after discovering he was a perfect match. Without a second thought, and of course an excused leave from the family business, the family became closer then ever imaginable. “Phyllis and I are incredibly proud of our children for the men they have become but overwhelmed by their bravery in the face of such unexpected adversity.” explained Shapiro. “It is an absolute nightmare to see your children laying side by side in a hospital waiting with each other to go in for major organ transplant surgery. This disease which affects 1.5 million Americans and over 100,000 of them here in Florida needs a voice. On a day like that day in the hospital Phyllis and I knew that we needed to be among those shouting out the need for awareness.” He continued. "Working with our son every single day, going to retail shows buying together and building our business together truly makes it feel like its Father's Day every day of the year. It is an amazing gift” explained Shapiro. “Now the opportunity to use our business to help spread the word about Lupus and raise money is what being a business owner is all about,” said Shapiro. Jeff Shapiro is now living in North Carolina, healthy and thriving thanks to the dedication of family. Apricot Lane multi-store owner Shapiro comes from an extensive resume in the retail industry. Holding positions such as President of Retail Division for Perry Ellis International. Sr. VP of Operations for Chicos, Sr. VP and Director of Stores for Saks 5th Ave Outlets, Executive VP of Operations for Ann Taylor and Regional Vice President for Lord and Taylor. He chose to open Apricot Lane and go the franchise route after a lifetime in corporate America because he liked the plans in place for the flexibility and his own ability to buy based on demographics and customer requests, ability to support causes important to him and potential to host events that give back in his community. Apricot Lane’s in South Florida features trend setting fashion apparel, jewelry, shoes, handbags, and accessories to create must have high fashion looks for an affordable price for both mothers and daughters, teens through 50’s looking for cutting edge styles and promises to embody all the characteristics that appeal to shoppers: a great selection of apparel and accessories, a warm and welcoming environment, and genuine, honest customer service and style advice. Whether someone is looking for a great pair of jeans to create a casual look, or a classy outfit to enjoy a night out on the town, Apricot Lane has the brands and accessories to express an individual’s style. Apricot Lane is a member of the popular Country Visions, Inc. franchise, specializing in offering a high variety of fashion-forward styles, accessories and gift items at affordable prices. The franchise offers a new mix of merchandise both online and in-store, and offers customers the ability to build a unique style. Approaching system wide sales of $50 million and growing at a pace of 20-30 stores per year provides new resources and opportunities system wide that will keep Apricot Lane Boutique on top as a fashion trend leader and top retail franchise.